Turn off the A1 at the exit Ybbs. 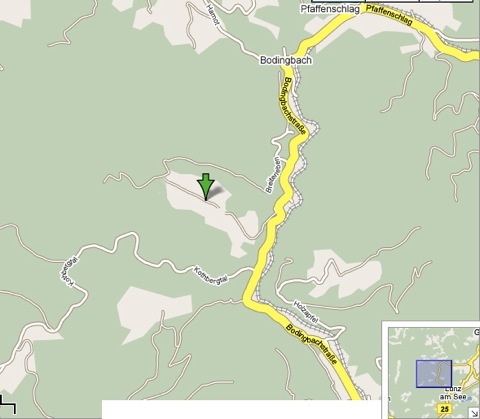 At the roundabout on the B25 head towards Wieselburg and follow the B52 until you reach Gaming. The house is located between Lunz and Gaming. Do not take the high road on the Polzberg, but drive over Pfaffenschlag and Bodingbach instead. After passing Bodingbach, take the second paved road to the right. Here you will encounter a T-junction after a few steep meters. Turn left to drive past a farm on your right. Soon after, you will reach a gravel road. Follow this road until you can see the house standing alone on a clearing. You will need snow chains or a four-wheel drive during winter.